I’m pleased to finally share with you a pattern that’s been a long time in the making. 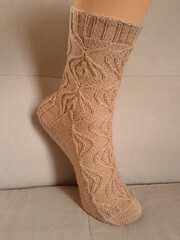 Meet my latest sock design, Sweet Onion! 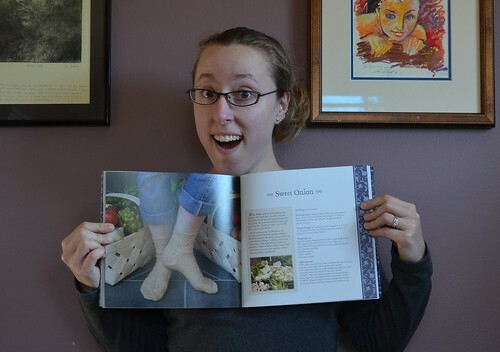 This is the first time I’ve had a pattern published in a real live ink-and-paper, bound-and-ISBN’d book: American Sock Knitting. American Sock Knitting includes 13 sock patterns inspired by various US states, designed by women who either live or grew up in those states. I got the pleasure of representing Washington state, which is a big honor considering all the amazing knitting talent we have up here. 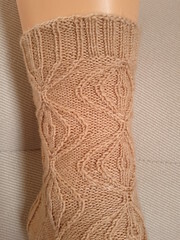 Detail-oriented readers will notice that I knit these socks over two years ago. This design (and its various delays) has been an interesting glimpse into the publishing world. In 2011 Planet Purl put out a call for designs for an “American Gift Knitting” book—the idea was to include 50 patterns, one from every US state, of quick and giftable knits. 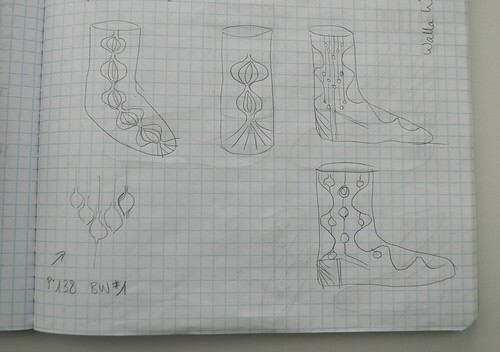 My design was initially accepted for this book, but I don’t think they got the range of submissions they were hoping for; so the plan changed slightly and they put out another call, this time for US-inspired sock patterns. That reset the timer and pushed back the publication date. After all the rounds of submissions, tech editing, copy editing, photography, layout, etc., the book was finally published in July 2013. Right now most of the photos I have include my goofy plastic foot; the sample socks are still on a trunk show adventure with their brothers and sisters. But I hope you like the pattern, and that it was worth the wait!